You can safely and easily make your baby's food with little time and effort. Homemade infant food may help cut food costs, and provide baby with food as nutritious, if not more nutritious, than store-bought baby foods. 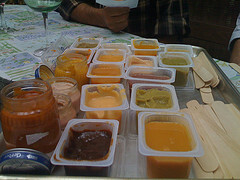 Making your own baby food will also help baby get used to foods the family eats. You can't see food borne bacteria in your baby food, or taste them, or even smell them, but these yucky, shifty, and annoying little critters can spread throughout your kitchen. Food borne bacteria of course, love residing where there is food. However, they also love cutting boards, sponges, and utensils. Some commonly home-prepared fruits for babies are ripe mashed bananas, and pureed bananas and applesauce. Dried prunes that have been cooked and pureed are another food for baby. Fresh pears or peaches in season may also be soft-cooked and pureed. Fresh vegetables that can be home prepared and pureed include potato, winter squash, sweet potato, peas, asparagus, and green or wax beans. > Always be sure to thoroughly wash your hands! > Never use the same cutting board for meats and fruits/vegetables. You should have a cutting board solely for meat preparation and a cutting board solely for vegetable/fruit preparation. 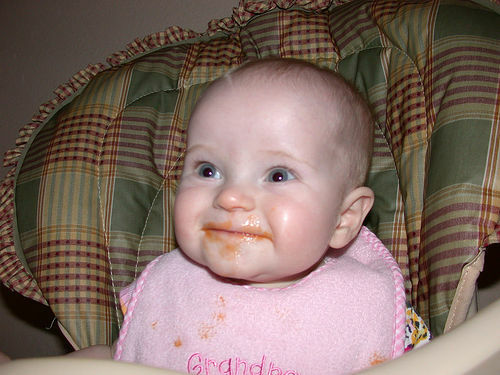 > Always be sure to thoroughly wash and cleanse the fruits and vegetables that you will be using to make your baby food. Even if you are not using the peels or skins, and even if you buy Organic, you should always cleanse the produce. > Always thaw meats in the refrigerator or the microwave and never on the counter! Babies and even toddlers need their meats "Well-Done"! Do not leave uncooked or even cooked foods out on the counter at room temperature for longer than 2 hours. Frozen foods should not be allowed to thaw and then be re-frozen without first being cooked. Cooked and prepared foods should be kept in the refrigerator for no longer than 48-72 hours before they are used or frozen. Foods in the freezer have varying storage times; it is prudent to use frozen baby food cubes within 1 (one) month. 1. Bake, broil, or stew meats. Remove the skin before serving meat and trim all visible fat. 2. Whenever possible, use fresh fruits and vegetables, and cook with very little water to best preserve nutrition. Steaming fruits and vegetables keeps the nutrition inside and you can make them very soft for mashing and purees. Don't leave produce lying around in the refrigerator for too long, either. Cook within a few days for maximum nutrition. 3. Puree to desired consistency with a small amount of fluid. You can use a hand mill, food processor or blender. Be sure to add a bit of water or liquid to the food processor and blender when pureeing. Test for smoothness by rubbing a small amount of food between your fingers. When preparing pureed food in batches, freeze some in ice cube trays and cover well for later use. Label and date all containers. Always thaw the desired amount in the refrigerator, never on the kitchen countertop. 4. For older infants, chop meat and poultry into very small pieces. Never add honey to an infant's food. Honey can cause botulism, a food-borne illness that's dangerous for babies. Serve plain foods. Reserve a portion of food for your infant and then add salt, pepper, and other seasonings you desire for the rest of the family to eat. Go easy on pureed beets, turnips, collard greens, or spinach. They contain naturally occurring nitrates that can result in anemia. Avoid adding raw or cooked egg whites to baby's food. Egg whites may cause an allergic reaction in children under the age of one, and raw egg whites are a food-borne illness risk. Here are some suggestions on thawing and warming food for your baby. Frozen food can be thawed in the refrigerator or the microwave oven on the defrost setting. But remember, food that has been thawed should never be refrozen. Stove Method: To warm food, place it directly in a saucepan and slowly warm over low heat, stirring often. Stir and test temperature of food before feeding it to your baby. Microwave Method: Microwave ovens heat foods unevenly and cause hot spots. There may be hot spots even if the food feels cool to you. It is important to stir food well to prevent burns to you or your baby. ·	Cover dish with a microwave-safe cover, not plastic wrap. ·	Stir food and turn the dish often during the heating process. 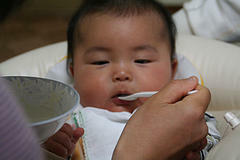 ·	Allow food to sit for a few minutes; stir well and test temperature before feeding your baby. ·	It is not recommended to heat pureed meats in the microwave. Hot spots in the meat could seriously burn your baby. ·	For other foods, heat food in a microwave-safe dish or an opened baby-food jar. What If I Can't Breastfeed?